Shaving brushes may be composed of either natural or synthetic materials with the handles often being decorative and made from a variety of materials but shaped for comfort and ease in applying shaving cream or soap. Shaving brushes are used by "wet shavers" together with a double-edged safety razor or a straight razor. Shaving Brushes are filled with bristles and the type of bristle and the quantity of ‘Fill’ combine to differentiate the quality of the brush. A mix of synthetic and natural fibres such as nylon and boar bristles is sometimes used to combine the qualities of both natural and synthetic materials. Synthetic fibre filled shaving brushes; Hard wearing and stiffer then a badger hair brush, and a less expensive alternative. A nylon fibre brushes is an excellent alternative to a Badger Hair brush and is a good brush to buy if you are trying wet shaving for the first time. Boars hair filled shaving brushes; Boar's hair is considered to be as stiff as synthetic bristle, but as a natural product, has a higher water retention capacity, making it easier to work up an effective lather, (See article ‘The Perfect Shave’). However, boar's hair has a tendency to break more readily than synthetic bristles and is less hard wearing. 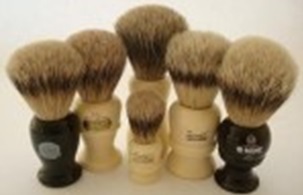 Badger hair filled shaving brushes; Badger hair comes in a variety of qualities. The natural material used for most shaving brushes is Badger Hair, this is because it is like human hair as it absorbs water and it is this characteristic that makes Badger Hair perfect for shaving brushes. Best badger is the term used to describe brushes made with the finer and more pliable hairs from 20 - 25% of the badger's body. It is longer in length and lighter in color than 'pure' badger hair. A 'best' badger brush is more densely filled with hair than the 'pure' badger brush and will produce a correspondingly greater lather. A super badger brush is a more expensive than either 'best' or 'pure'. Sometimes this hair is described as 'silvertip' and it is often highly graded 'pure' hair bleached on the ends to resemble silvertip. Though it is composed of 'pure' badger hairs, 'super' is graded and sorted so that its performance is superior to that of 'best' and the result is a brush that is not ‘prickly’. To tell the difference between 'super' or 'silvertip' badger hair, to look at the color of the bristle tips. A true 'silvertip' brush has tips that are off-white. A 'super' brush has bristle tips that are a plainer, slightly grey white and the light color of the tips does not extend as far down the shaft of the hair as a ‘silvertip’ bush. A silvertip badger brush is made from pure, top quality silvertip badger hair and is the most expensive type of badger hair. The tips on this hair appear white naturally, without bleaching. The "flared" bristle load gives the silvertip brush its ‘full’ appearance and allows the brush to retain a large amount of water. With its greater water retention capacity, a silvertip brush can create a full shaving lather quickly. Click on the picture to find the perfect shaving brush for you.